Criques de Porteils luxury camping site is situated in cultural Collioure, in the gorgeous region of Roussillon. It enjoys direct access to an idyllic pebble-stoned beach area, and is swaddled by the Mediterranean sea and a majestic, mountainous backdrop. 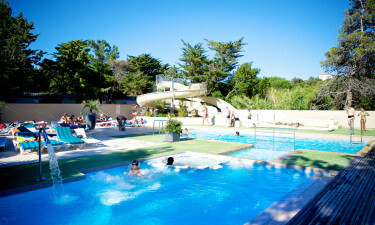 This popular holiday resort overlooks the Argelès Bay giving a panoramic view of French coastline. To book your mobile home in this heavenly haven, call LUX-camp today and we'll organize everything for you. Welcome to Criques de Porteils Campsite. What's so good about Criques de Porteils luxury camping? Gorgeous harbourside restaurants right on your doorstep. 2 pool complex for all the family to enjoy. Onsite mini vinyard where you can sample some French wine. Access to private pebble-stoned beach area. A third-party company based in Collioure town runs a scuba service on this lovely family-inspired parc. It also has two modest pools, both of which are heated and come equipped with pool slides and a jacuzzi feature. There's a lot of terraced areas for sunbathing and two playgrounds and a trampoline for younger ones, not to mention there's a kid's club too. Active adults can avail of the running track. The tennis and basketball course are a must and for those who like a bit of footy there's a resident football pitch. Criques de Porteils camping holiday has a selection of mobile home accommodation, all of which comes equipped with all modern conveniences. Knowing that not all guests come to enjoy non-stop physical activities, this campsite offers an alternative choice of special things to do; land art, paper mâché, pottery, body painting, make up, stand up paddle and Yoga classes. 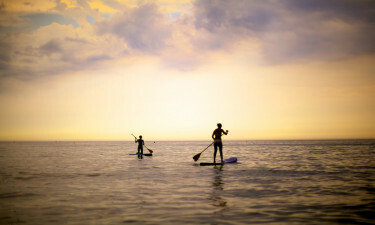 Further afield you can access crazy golf, boat trips, horse riding, wind surfing and canoeing. For the more adventurous spirits, why not pop into Canyoning Park? Canyoning is a modern, vigorous kind of sport, for those who like to take things to the extreme. Canyoning Park is a big tourist attraction and is sure to set your pulse racing. It's a reconstruction of a real canyon kitted out with artificial waterfalls, underground rivulets and deep plunge pools. You'll have access to overhead zip wires and cargo nets so you can get exploring with the family. Please note, though, children must be over 8 years of age to participate. Dining at Criques de Porteils campsite couldn't be easier as you have your very own resident restaurant; Restaurant Le Camalou. 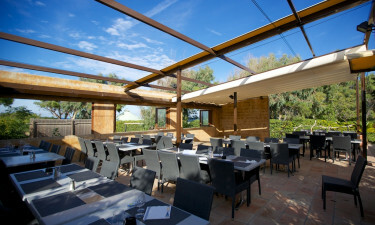 You can eat indoors or under the French skies al fresco style. If you fancy giving cooking a miss, there's a take-away service with all the usual favourites on the menu, which is useful to keep in mind if you're catering to some fussy eaters! The site also has one bar. Criques de Porteils campsite has a small grocery store, which stocks everything you will need when camping, but the town of Collioure is only 2 km away and has lots more shopping outlets for you to enjoy browsing through.